I've been messing around with V2 lately and i'm not able to obtain a good glass result like it suppose to be. Anyone manage to achieve that? Nick, if you download this scene, it has glass and water configured. Yeah oli, its from the link you post some time ago. Thanks bigstick for the scene, but I'm far from the result I expected. Real glass is clear, only visible by reflection and refraction on edges. Even by playing with settings can't get it right. Heres your glass (changed the color), looks good in a window or something but for a water glass thats not it. You're right, this setting is for what is often referred to as 'thin glass', which is for windows. This is what Podium is mostly used for and as you didn't really specify what you wanted to model (even though you posted the link) I assumed this is what you wanted. As for glass as in drinking glass, I can't help you with this I'm afraid. "the science of CGI....very good resource"
Now a test, just try to model (and render) a simple glass of whiskey, some ice, lighting. Its really hard to do it. You need transparency, blur transparency, translucency, SubSurfaceScattering (SSS), caustics, reflections (blur reflections too) refraction. This is too much, yet all these are properties of these simple materials. Now a nice lamp with a semi-transparent 'hut' near a wall, a leather sofa. Now a curtain. he he SOme more emitting materials too. Now tell me that I'm the only one who needs these. Because I don't, actually I find all these boring. A simple modeling 'adventure' is what makes me almost happy. 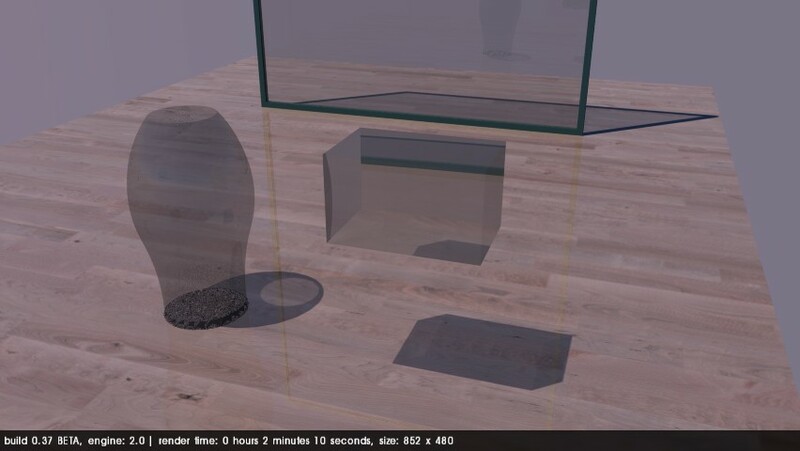 I'm looking into 'real glass' as opposed to 'thin glass' at the moment, while I'm looking at caustics. We need an intuitive, easy to use (and configure) solution for this. We have an issue with refraction too since Sketchup only uses faces and no solid. Most of us use 2 faces to represent a window and that causes strange results has it doubles the refraction. so great and so cool. I'm trying to get a good glass too- I'm making a glass box that sits on a food counter and it comes out a little dull; any advice?